Accurate or not, the phrase "it just works" has been closely tied to the Apple camp for eons -- and obviously, the iPhone tries to ooze that mantra from its every pore. Without ever having made a phone, though, Google already had a leg up in delivering on this promise to handsets by owning a service platform that virtually everyone uses in one capacity or another. Sure, plenty of people use MobileMe, but it really doesn't hold a candle to the Google juggernaut -- and even if it did, Apple hadn't counted on making seamlessly integrated, synchronized services part of its mobile platform from the get-go. But what does that translate to in terms of usability? It's difficult to accurately describe how utterly painless it is to set up and use the G1 for the first time: you just enter your Google account's username and password and you're off to the races. If you don't have an account -- well, first of all, welcome to civilization. Second of all, no worries -- you can create one in less than five minutes' time right from the comfort of your phone. If you already actively use Google Calendar, Contacts, and Gmail, your data just seamlessly appears after a couple minutes of initial synchronization, quietly and with no fuss. Magic. Problem is, most people that use Gmail aren't also actively using and managing Google Contacts. The app regularly gets panned as a tacked-on afterthought in Gmail, and we'll just say it straight out: it's truly awful. If you've used it, you know what we're talking about -- it makes managing contacts a laborious pain, and provides only the bare minimum of tools to get your info in order. Like it or not, you're joined to it at the hip the moment you make this platform a part of your life. If you're not keeping on top of it, it'll automatically add entries for anyone it decides you're emailing frequently, which means that over time you end up with this massive, unruly, and essentially useless list of email addresses. By default, this junk all gets transferred to your phone, making for an intimidating, frustrating experience the first time you open your little black book from the G1. It's easy to create a new group of Android-specific contacts -- and smartly, the phone also allows you to show only contacts that have phone number associated with them -- but we would've liked to have seen a wizard either on the web or phone side that makes cleaning up your contact list a breeze. Despite the shortcomings, Google has still managed to completely eliminate one of the biggest pain points in the wireless world: changing phones. Even with ActiveSync, iSync, Intellisync, WhateverSync, the process of bringing a new phone online has usually been hairy at best, largely because you're moving across heterogeneous platforms. Sometimes the sync goes the wrong way and wipes out data on your PC, sometimes data just flat-out refuses to transfer, and quite often, you've got to physically connect the device to your computer to make it all happen. If you're not using a smartphone, the situation's even worse; sometimes your carrier offers a solution for transferring contacts, sometimes you can get stuff where you need it to go over Bluetooth or the little chunk of storage on your SIM, but any way you slice it, it's not pretty. With Android, Google has the luxury of being able to take the monolithic approach -- you're always precisely one login and about sixty seconds away from having your entire world downloaded to you over the aether. For end users, the benefits of storing data in the cloud are more tangible than ever. That "cloud" just happens to belong to Google, and once you're in the ecosystem, it's hard to get out. Google AdWord revenue, secured. The G1's interface skin -- Android's default for touchscreens and only released skin thus far -- is thoroughly modern and attractive, but its high-contrast, almost cartoonish look might be a turn-off for some. In a sick, twisted way, that dovetails nicely with the fact that Google's stonewalling the enterprise market for the moment by leaving out support for VPN, Microsoft Exchange, and BlackBerry Enterprise Server; it's just a hip-looking, totally approachable UI that doesn't reek one bit of corporate starch. We'd still like to see a ton more configurability here, though. Google's own "Spare Parts" app, a free download from the Market, gets the ball rolling by allowing you to change the system text size -- something that clearly should've been including as part of Android's standard build, especially considering accessibility concerns and the fact that the default size is pretty freakin' huge. For example, in its shipping configuration the Settings application can only show six menu items at a time in the portrait orientation, and Gmail shows a fraction of an email more than that. On a 3.2-inch 480 x 320 display, that's just not enough for everyone. To add insult to injury, the current version of Spare Parts is buggy -- if you change screen orientation, text size reverts to the default. Android's easy to use, but it's not always consistent. For folks coming from other platforms (which we guess is everyone, since Android's brand spanking new), that could be a little frustrating and make the learning curve steeper than it has to be. Here's an example: to delete a contact, you long-press their entry. The selection highlight will fade from orange to white, and after a moment, a contextual pop-up menu will appear, where you can choose "Delete contact." Okay, that's all well and good -- but try using the same paradigm in the alarm clock. No dice, right? Doesn't matter how long you hold your thumb on that alarm, sport, it's not going to give you a pop-up menu. Here, you inexplicably have to short-press the alarm, which takes you to another screen; once you're here, you push the Menu button and choose "Delete alarm." It's not hard, it's just needlessly different. Speaking of long presses, we did have some problems with the G1 being unable to distinguish between a long press and a scroll motion. The instant the phone detects that your finger has moved, it kills the notion of the long press in progress until you lift your finger off the screen and try again. Theoretically that's not a problem, but it's really easy to accidentally move your thumb just a millimeter too far while waiting for a pop-up menu to appear, which triggers like a one-pixel scroll of the list instead. On the flipside, these same long presses we're complaining about enable copy/paste between any two text fields in the system, so we've got to give them their proper due. Granted, we frequently hear "I've never used copy/paste on my phone in my life," but we think the root of that attitude stems from the fact that many users are accustomed to phones that don't support it or aren't powerful enough to make it worthwhile. Android's at that level, though -- and with the G1 clearly taking the so-called "Sidekick Pro" market head on, we think these same folks are going to use it, like it, and refuse to go back to a platform that doesn't support it. All it takes is a few copies of lengthy snippets from an email to a note or a calendar for it to earn its keep, as far as we're concerned. It might seem like a minor point to make, but you'd be surprised at how quickly this becomes a huge part of your G1 experience: Android's notification system is world-class. In fact, it's the best we've ever seen on any phone or any platform. The first piece of the puzzle is a totally average-looking status bar that appears at the top of basically every screen. To the right, you get the standard information every self-respecting phone is going to provide you: time, battery charge, signal strength, data network status, WiFi, and silent mode. To the left side, though, is where things start to get interesting. 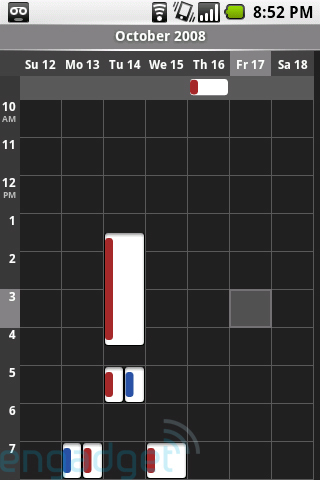 Over here, any app can place an icon to indicate that something interesting has happened -- instant messages, emails, voicemails, schedule reminders, and so on -- and optionally scroll a brief message (say, a snippet of a received SMS). Already, you're looking at a system that beats Windows Mobile and the iPhone, and we haven't even gotten to the good part. That's just the start, though. The real prize is the pull-down curtain, actuated with a downward drag of a finger from the top of the screen, where notifications go to live on a more permanent basis until you delete them. The great thing about this screen is that each notification has room to stretch out and display plenty of details: who sent you the text message, what did it say, who called you, when did they call you, and so on. And because the curtain is part and parcel of the status bar, it can be accessed from anywhere in the G1 that you can see the status bar (which is basically everywhere). It's brilliantly executed, works really well in practice, and makes Android the only platform that takes alert organization seriously. Android does a fabulous job of managing the switch between portrait and landscape modes, which is a good thing considering that you'll be making that transition a lot. Too much, actually -- as we mentioned in the hardware write-up, without an on-screen keyboard out of the box, there's little option but to go from one-handed portrait mode to two-handed landscape mode each and every time you encounter a text field. We couldn't find a single screen anywhere on the device that didn't handle the change in orientation gracefully; icons, buttons, fields, and graphics all rejiggered themselves into logical places each and every time. We found ourselves waiting as long as three-quarters of a second or so on occasion for the transition to occur after we'd opened or closed the keyboard, which we think falls shy of becoming an annoyance (though just barely). One of Android's most endearing qualities -- and perhaps the first thing new users will notice -- is the home screen. It's really attractive, but that's pretty easy to pull off; more importantly, it's extremely functional. First off, you can add shortcuts to applications, web bookmarks, individual contacts, music playlists, and pretty much anything else an app developer wants to expose. These all look just like the icons you're used to seeing on your PC, and you can position them wherever you like. Down the road, the second part of this one-two punch will be widget support, and we think this is where the home screen's true value lies. It reminds us a little of Samsung's TouchWiz concept, but by the nature of Android's extensibility, it'll be far more useful. Sadly, developers can't build their own widgets in version 1.0 of the SDK, but Google says support is on the way. Whether that'll happen tomorrow or a year from now is anybody's guess. Put simply, the widgets will turn your home screen into a destination. After all, it's not just a place to launch apps -- that should be a very, very small aspect of what the home screen does for you, and that's a lesson that the iPhone and most dumbphones have yet to learn. You'll come to the home screen to check the weather, news, sports scores, your RSS feeds, run a couple web searches, and do pretty much anything else the legion of Android developers can dream of cramming into a pretty little space. That all said, the home screen isn't without its faults. We're not sure why Android restricts you to exactly three panels' worth of screen real estate, for example -- it seems totally arbitrary. We suppose you'd need an insane number of shortcuts and widgets displayed to run into a problem there, but that's for the user to decide, not Android. Also, the method for deleting items from the screen is totally out of left field -- you drag them to the applications tab, which temporarily turns into a trash can while you're dragging. Probably not the most obvious technique. 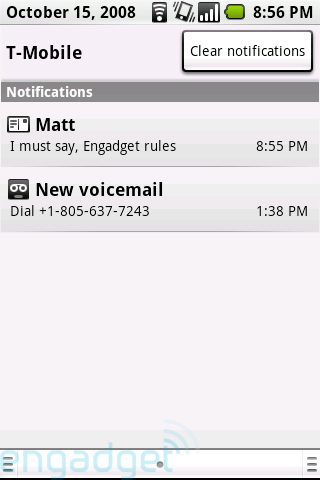 The G1 comes out of the box with mobile versions of Google's Calendar, Contacts, Gmail, and Google Talk services. Forgetting for a moment how good or bad each app is on its own, we can't emphasize enough: the pervasive nature of your Google account throughout Android is an absolute boon, and these apps are the central reason why. Your data's just there without any fuss, and so far, we've had a hell of a lot fewer hiccups with it than MobileMe did in its infancy. Calendar is good, but not great. Going into it, we'd hoped it would be a faithful replication of Calendar on your desktop browser -- but perhaps that's asking too much. The feature most notably missing (as far as we can tell) is that you can't add guests to events that are created on the G1, which to be fair, probably won't affect most folks. In general, we got the impression that Google intended the Calendar app on Android to be primarily read-only with some in-case-of-emergency writability thrown in as a precaution, and used purely as a mobile view of the schedule you've set up through the web view, it's totally acceptable; you've got agenda, day, week, and month views, you can see all the calendars you've created and had shared to you, and the integration with Android's notification system is perfect. Like the iPhone, Android actually treats contacts as a part of the Dialer rather than giving them their own dedicated application. That works just fine, especially considering that it still gets its own application icon for the tab in the home screen (in fact, you can create a shortcut icon to an individual contact, if you're so inclined). We like how contact data fields are treated -- different types of data are offered to perform different activities. For example, if you assign a phone number to a contact, you'll immediately see that number under both "Dial number" and "Send SMS/MMS" headers in their details screen, which makes it pretty easy to use Contacts as your jumping-off point for doing a whole bunch of common social tasks on the phone. 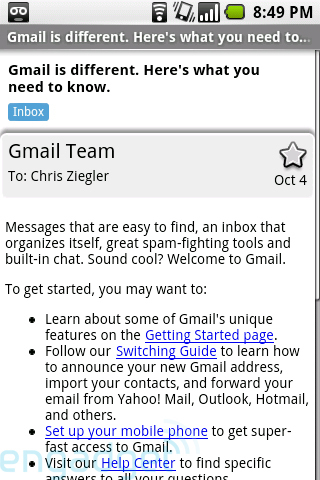 Android's Gmail client is, for lack of a better word, amazing. Most importantly, it offers push that's actually pushy enough to be called "push" -- in some cases, we actually received new emails on the G1 before our web client. It's also designed to mimic all of the web version's most important Gmail-specific features, like conversation threading, archiving, and marking as spam. Naturally, it knows how to integrate with your contacts, and like almost everything else here, it makes expert use of the notification system. One huge, painful drawback here is that popular attachment types -- PDF, Office, and OpenOffice documents, specifically -- are only supported by virtue of Google's automatic HTML conversion on the server side. Android itself doesn't understand any of these, so it lets Google do the conversion and simply shows the typically mucked-up results in its HTML viewer. What's more, you can't save them to your device; you've got to go back into Gmail and reload the attachment as HTML each and every time. There's a huge third-party development opportunity here, and we're hoping there are plenty of companies already cooking up solutions. Unfortunately, not everyone uses Gmail, and depending on your situation, you may not be able to switch. This is where it starts to get a little hacky. The G1 actually features two completely different, completely unrelated email apps: one for Gmail specifically, and one that's considerably less cool for everything else. It's obvious that this is Google's passive aggressive way of saying "if you want the Android experience, you've got to drink all the Kool Aid," but they can't really be faulted entirely. The world's garden-variety email servers -- of which the G1's app supports the POP3 and IMAP varieties -- don't support all of the goodies that Gmail specifically does, and to be fair, they've tried to make the process a little less painful by automatically detecting popular email types (Yahoo! Mail and Hotmail, for example) and configuring them without any user intervention. The app works well and can load HTML-encoded emails with aplomb, but we're kind of weirded out by just how different it looks from Gmail. What's with the black versus white thing? Lots of users are going to be using both apps, so we would've liked to have seen more consistency here. Oh, and that HTML rendering we mentioned that Gmail uses for showing attachments? Yeah, no go here -- you'll have to forward them to your Gmail account or wait until you get back to your PC. 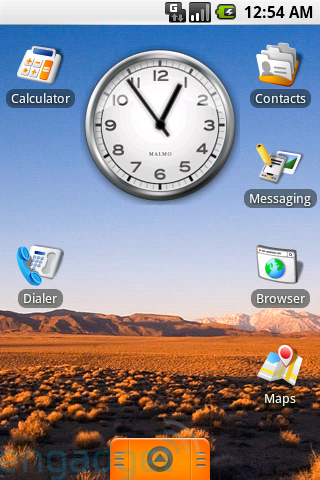 The IM app supports AIM, Google Talk, Windows Live Messenger, and Yahoo! Messenger within a single framework, which is a nice touch on Google's part (we wouldn't have been surprised to see them just support Google Talk) and saves you a few bucks that you might otherwise have to spend on a decent third-party solution. Google Talk is automatically configured and ready to go by virtue of your Google account being logged in, and actually, it's automatically on and running in the background from the moment you turn on the phone. Messages come in unobtrusively via the notification system, and of course, you can sign out individual accounts or all accounts at once if you need to. First things first: no Flash support yet. Now that we have that out of the way, the G1's WebKit-based browser does bang-up job of rendering sites as faithfully as Mobile Safari (they're using the same rendering engine, after all), but the user experience is decidedly different. First, there's the issue of multi-touch -- the G1 doesn't support it at this point. There's some disagreement on how much multi-touch ultimately matters to the user experience, though, and let's put it this way: the G1 offers hands-down the best single-touch experience for browsing that you can find. Flick gestures work exactly as you hope they would, continuing to move the page after your finger has left the screen and slowing to a stop. Panning brings up zoom buttons at the bottom of the screen, but your main tool might actually be the magnifying box, which is called up by pressing an icon in the lower right of the app. The idea is great -- it automatically zooms out the page, offers a small, magnified box that you can drag around, and when you let go, you zoom into that area -- but we found that it became hard to control on large pages because even a small movement of your finger translates to a significant amount of scroll on the zoomed-out preview. We could definitely get used to it, though. As we alluded to in the hardware section, page load times lagged way behind the iPhone 3G when both devices were in 3G coverage, but once the pages were loaded, scrolling was smoother on the G1. Actually, maybe "smoother" isn't the right word here -- both devices scroll pages smoothly -- but the G1 was able to do so without resorting to temporarily filling your screen with a checkerboard pattern until it could get around to re-rendering your view. With the keyboard open, you can just start typing a URL or a search term, and as long as you don't have your cursor in a text box on a web page, the browser will know to pop open an address bar and let you do your thing. Like Chrome, the app unifies addresses and searches into a single box, which is great on a mobile device where you're always looking for ways to minimize tapping. Unfortunately, even basic navigation buttons like Back, Forward, and Bookmarks are hidden unless you press Menu, which doesn't make much sense. In fact -- get this -- you actually have to press Menu, then More, then Back to navigate back one page without moving your thumb way over to the physical back button to the right of the screen. It's not that big of a deal, but since the back button is in play elsewhere on the phone, it can get a little confusing (and it can back you out of the app). There's a keyboard shortcut for it, but frankly, that (along with Forward and Bookmarks) is something we want on-screen at all times, even if it costs us 30 or 50 pixels of real estate. 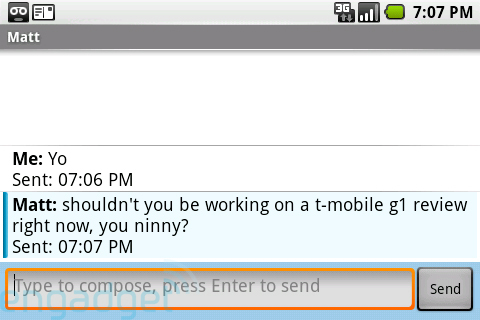 We guess we can't really play the "whoa, threaded messaging!" card here anymore, now that manufacturers have wised up to the fact that it revolutionizes the SMS experience and have started bundling it as a matter of course on modern smartphones. Android goes along with the trend; no killer features here, per se, but it gets the job done and nicely inlines SMS and MMS messages into the same thread. One nice touch is that it'll let you take a picture or record audio in real time -- no need to hop out to the Camera app when you want to send a quick snap of what you're seeing. Sending messages to multiple recipients is a breeze, too; in a rare show of consistency, the interface is nearly identical to the email composition screen. Is AmazonMP3 the G1's killer app? Nah, Android itself is the G1's killer app, but having access to Amazon's vast (and cheap) library of non-DRM music on the go is a pretty comforting thought. We're a little surprised that Google and Amazon decided to lock downloads to WiFi; it's a move that doesn't really fall in with Android's free, open mentality, and we're hoping it was concern for the user experience -- not T-Mobile pressure -- that led them to make that call. It's not a pretty app by any stretch, and it doesn't fall in line with the UI standards set fort by the phone's other programs, but it doesn't need to be; it just needs to work, and work it did. We had some problems with album artwork occasionally not loading, but only made the whole affair even less attractive. When we can get the Misfits' Static Age for $8.99 from the comfort of our local Starbucks, we'll learn to live with it. The music player is straight up bare-bones, and we're already pulling for a few viable replacements sprouting up in the Market over time. It'll show you album art, has a Party Shuffle mode, uses the notification curtain to give you Now Playing details, and lets you assign a song you're listening to as your ringtone in real time -- which is kind of cool -- but it has no controls or track information visible when the phone's locked and has literally zero audio adjustment controls. It also doesn't play protected content -- but if you're seriously considering Android as a platform, odds are good (well, hopefully, anyhow) that you don't have much protected content to begin with. Assuming you're not buying all your music from AmazonMP3 over WiFi, you'll probably be connecting your G1 to a computer at some point to load tracks. We love that it doesn't try to get fancy -- you plug it in with any old mini USB cable you have lying around and the phone's microSD card just shows up as a mass storage device. The coolness ends there, though, because the Pictures, Camera, and Music apps just totally crap out once the drive is mounted to your PC on account of that whole "can't mount the same drive from two places at the same time" conundrum (it's kind of like the movie Timecop, if you're familiar). Going into the cam, for example, tells you to insert an SD card -- which is awesome, considering there's already one inserted. It's an annoyance, and if they can't figure out how to keep the storage mounted internally while it's connected to the PC, they should've at least bothered to clean up the error messages. 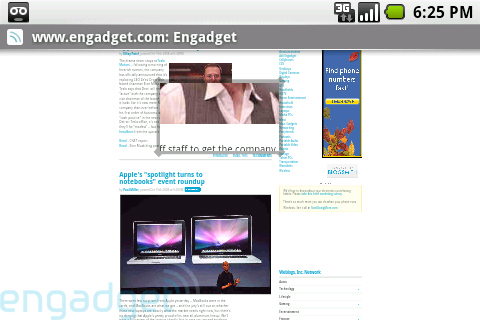 There are obvious parallels to the iPhone's YouTube app here, and Android's version definitely holds its own. The gesture of swiping horizontally to move through featured videos felt vaguely awkward, but it's the freaking YouTube app we're talking about -- we've already said too much. It's got all the same functionality that the iPhone cut brings to the table with the added bonus of a category browser, a nice touch. Video quality is about on par with what you can expect from the iPhone, too, with plenty of degradation over EDGE or 3G. We've never been huge fans of mobile YouTube to start, but unless you're a diehard time-waster, we wouldn't bother here unless you have access to WiFi. We feel like we won't get an accurate picture of just how good the Market is until it's out of beta mode and starts offering payment collection for developers, but already, it's a destination that new G1 owners won't want to miss. There are plenty of great apps to explore here, and thanks to Google's open attitude, we should see a ton more added on an ongoing basis. Of course, the lack of oversight also means the signal-to-noise ratio is lower, but the Market has a handful of features to help users figure out what's good and what's not. For starters, there's a Featured section at the beginning of the Market's home screen that's maintained by Google (which uses that same weird horizontal swipe gallery as YouTube, coincidentally), and each app category can be sorted by popularity or date added -- good for finding the best apps and the freshest ones, respectively. 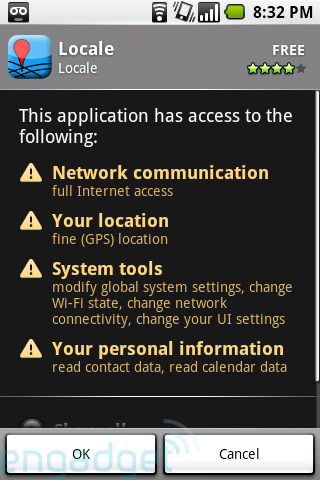 Perhaps the coolest feature here, though, is the security warning for each app you download. Android can determine what potentially sensitive features of your phone the app will have access to, which should theoretically help you make smarter decisions about the kinds of things you're comfortable downloading (and by whom they're published). It gets really in-depth, too -- it doesn't just tell you that the app has access to your personal information, for example; it tells you that it can read contacts and calendar entries. Really nicely done. At the end of the day, however, this isn't about the hardware, and really never was. 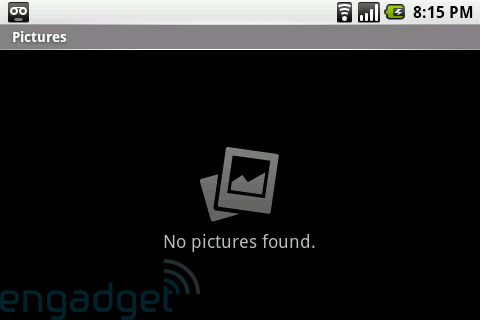 The story here is Android and what it promises... though doesn't necessarily deliver on at first. Like any paradigm shift, it's going to take time. There is tremendous potential for this OS on mobile devices -- it truly realizes the open ideals laid out by Google when they announced this project. The only problem seems to be the stuff they either left on the back burner, cutting room floor, or hoped would come from that exciting, untapped world of open source developers. While there's plenty to praise in this phone, there's a lot more that's missing -- and some of those missing elements are what we consider to be core components of a device in the G1's class. Shortcomings aside, though, you're still buying into one of the most exciting developments in the mobile world in recent memory. When you put the G1 up against, say, a Sidekick LX, it seems like a no-brainer for T-Mobile customers looking for a powerful QWERTY device -- especially at $20 less. You don't need to be a cutting-edge mobile geek or a pundit to do that math. When facing off with platforms like the iPhone and Windows Mobile devices, it holds its own, but has a lot of ground to cover before it's really making the competition sweat. Still, if you're just excited to be a part of a platform that's likely going to be around for a very, very long time, the G1's a totally reasonable day-to-day device to make it happen, and we expect some pretty great things from this corner of the market down the road.